This is much more of a kiln problem than a glaze problem. What kind of kiln are you using? I think you could work on getting it a few cones apart not 4 cones apart. I never worked with glazes that word at cone 6 and come 10.I'm not sure any exist unless they are dry mattes at all temps. How about working some toward evening this kiln up. This is much more of a kiln problem than a glaze problem. What kind of kiln are you using? you can view this picture. It is an old school kiln with 4 natural gas burners in the bottom corners with an arch roof with two rectangular exit flues in the center. About 11CF. It's hard to tell exactly from the picture, but it looks to me like your shelves are too big for that kiln, that they're preventing good circulation. The extreme unevenness suggests that as well. How much space is there between the shelves and the side walls? And the front and back walls? Oh yeah... if that picture is giving an accurate impression, NO question this is the issue with the kiln evenness. Dead on, Neil. You should have about 3 1/2" to 4 1/2" of clearance from the right and left edges of the shelves (looking from the door) to the side walls of the kiln. I'm amazed you are getting it to fire as well as you are with that shelf configuration. Can't tell from the picture... is that updraft or downdraft? You say two exit flues....... in the lower back wall (away from the door)? In the center of the arch? In the center of the floor? Yes the flues are in the center of the arch (updraft). On the left and right side of the shelves are the burners where their will be 4.5 inches of space, the back wall has no space, in between the shelves their is no space, and the front by the door has 4.5 inches too. Let me know what needs to be done, do I need to cut the shelves (I have done this before so it is nothing new) and if so how much am I cutting for space in between the shelf and back wall space. Thank you so much, I would have never known this. OK... the picture is misleading. It looks like the shelves are VERY close to the walls on the sides in the image. You have enough clearance there for the fireboxes for that burner configuration. Also that it is an updraft is another important piece of "missing" information. So............ same shelves. Spaced differently to start with. Divide the 4 1/2" you have at the front door side by 3. Call that about 1 1/2" each. Space the rear shelf about 1 3/4" off the back wall. Space the gap between shelves to 1". Space the gap to the door about 1 3/4". Make ONLY that change... and see what happens in the next firing. PS: I f the burners are firing into the corners from the side or end walls... then there are different things that need to be done. Updraft kilns are touchy, but once you figure it out it's a piece of cake. Every kiln has it's own personality. My friend has 2 identical Alpine updraft kilns at his school that sit next to each other. They have sequential serial numbers. One fires an hour slower than the other, and any attempt to speed it up makes it go uneven. The first gas kiln I learned to fire was also an Alpine updraft. I figured out a schedule that was about 2 hours slower than what it had always been fired on, which solved all the unevenness issues. For an updraft to fire evenly, you have to keep the damper closed up enough that there is back pressure out the bottom spy hole. With the damper cranked down you can't pump too much gas or air in, though, which may mean a slower firing than what you're currently doing. 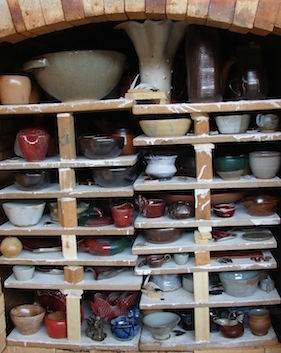 John, now you are talking to my heart....how to pack a kiln. Is there anything published about the mystery and science of "kiln packing?" Also, if there is a book like "Even Kiln Firing for Idiots", many of us would love to wrap our brains around it. When you, Neil, Mark, and Marcia start talking about bag walls, air space, and firing schedules it is so cool. My updraft has space in front and back-my 6 burners shoot straight up.4 are in the corners. The shelves are centered in between them. There is space for the flames to go up. The bottom is always hotter the top is cooler. my shelves are 1 inch off the floor. I have some small space between shelves.I use 12x 18 shelves on bottom and in middle I use 12x24 in middle of load as I have so many of that size. I keep the damper 1/2 closed as it climbs and than close it more after 1800 for reduction. The kiln fires about 1-2 cones bottom to top.The fire is 8-9 hours-slower the better. The kiln fires about 1-2 cones bottom to top.The fire is 8-9 hours-slower the better. This sounds about typical even-ness for most updrafts for high temp glaze firings. And I too learned to fire my first gas kiln on an Alpine updraft in college, Mark. Sorry you are out in Utah....... you'd like to take my "Kilns: Design and Operation" course. I've taught that at MassArt, Boston University Program in Artisanry, and New Hampshire Institute of Art. I think the first time was back in about 1975..... or 76 ...and still doing it. Of course it has evolved . Really...... kiln design and operation is all based in science and engineering. The more variables that you control... the easier it is to get them working right. Problem is for us studio potters, we don't control too many of those existing variables. Industry does......... with liberal applications of money. We usually can't do that. So we have to "figure out" specific kilns a lot. Our studio kilns typically aren't too far removed from old historic precedents. Some better ones that are available unfortunately carry a high price tag. And the complexity of home-buildimg a more high-tec kiln is usually beyond the technical and economic means of most studio artists. You can get Alpines within 1/2 cone if you slow down a little more. The Alpine I learned on in 1992 had its 30th birthday that year. It was fired for another 10 years or more after that. The art building was a big Greek style structure with stairs and big columns in the front. The kiln lived underneath those concrete stairs in the garden-level basement. They had moved the into place and then built all the studio walls around it. When they moved the ceramics department to a different building I heard they just bricked up the doorway to the little room it lived in. When they moved the ceramics department to a different building I heard they just bricked up the doorway to the little room it lived in. With it still in there? My updraft is a Berman brand-a little known out of business kiln maker from Hollywood,Ca. Yes! It would have been a major ordeal to get it out. I never new that having the flame come out the bottom would even things out. Flame out the bottom spy hole means there is pressure throughout the kiln, and pressure helps to keep thing even. It doesn't have to be a lot of flame out the spy, just a little puff to show that there's pressure down there. NO.... no need to CUT the shelves. You HAVE the necessary space on the sides from your written response. SPACE OUT the shelves as I mentioned. However we need the answer to the question about how the burners enter the chamber in the corners I posted above. THAT will determine a possible different approach in case the burners do not cone in thru the floor. Just back from a busy day. I t does look like the shelves are up against the right wall , but I think it is the lighting. I would recommend staggering the height of the shelves.. Open the space along the back wall. as John suggests. The Updraft I fired in UT Brownsville, Texas had 14 burners on two gas circuits. There was a maze of bag walls under the first layer of shelves where the burner ports came in closer to the center and the flames were channeled out to the walls. The outside ring of burners came in along the walls shooting up. Staggering the shelves would open the space between them and not seal off the flames. You should be getting a soft flame out the bottom ( as Neil suggests) and a harder flame out the top. IMO. Everybody has their own way of firing. 11 cu ft. is small. You should be able to even it out. Firing slower should also help get it even. make sure your posts line up one over the next. That post in the middle of the top layer makes me cringe that it could break a shelf without support underneath. This kiln was an Olsen kit 20+ years old and moved two years before this photo. There were 4 columns of shelves in this kiln.Notice cones are even. Line your posts up for sure otherwise you will warp and crack the shelves. Inorder to bring the shelves towards the door I will need to make some small cuts so it will fit into the doorway. Also the burners are right bellow the kiln and there are holes in the bottom 4 corners where the flame enters through 5inches of fire brick into the kiln. olsenfiringSM copy.jpgJust back from a busy day. I t does look like the shelves are up against the right wall , but I think it is the lighting. I would recommend staggering the height of the shelves.. Open the space along the back wall. as John suggests. The Updraft I fired in UT Brownsville, Texas had 14 burners on two gas circuits. There was a maze of bag walls under the first layer of shelves where the burner ports came in closer to the center and the flames were channeled out to the walls. The outside ring of burners came in along the walls shooting up. Staggering the shelves would open the space between them and not seal off the flames. You should be getting a soft flame out the bottom ( as Neil suggests) and a harder flame out the top. IMO. Everybody has their own way of firing. 11 cu ft. is small. You should be able to even it out. Firing slower should also help get it even.